The Air Quality Index in Delhi stood at 403 on Friday morning, a day after Diwali this year, which was comparatively better than last year’s post-Diwali AQI of 445. This is despite a full ban on the sale of firecrackers in the entire National Capital Region by the Supreme Court, which is being enforced till October 31. 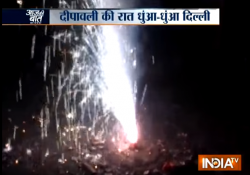 Firecrackers were burst on a large scale on Diwali night, but it would be difficult to make comparisons of air pollution with last year’s figures. The presence of harmful particulates in air depends on the weather of that particular day. Last year, when Diwali was celebrated, winter had almost set in, whereas this was not the case this year. Normally smogs do not occur if the temperature is on the higher side. Moreover, the pollution level was lower this year because harvesting is yet to be over in the neighbouring states, whereas last year harvesting was over and farmers were openly burning stubble in the fields. This year there is widespread awareness against burning of stubble. One major contribution to air pollution in Delhi comes from the emission of carcinogenic gases from the diesel vehicles. The National Green Tribunal, in November 2014, had ordered a ban on plying of all 10-year-old diesel vehicles in the NCR, and last month, it dismissed the Centre’s plea for modification to this order. According to experts, one old diesel vehicle causes pollution equivalent to 24 petrol vehicles or 36 CNG vehicles.There are more than seven lakh diesel vehicles in Delhi. Firecrackers are burst only on Diwali night in the capital, whereas diesel vehicles run daily, contributing massively to air pollution. Therefore, to assume that air pollution in Delhi-NCR this year post-Diwali was less would be incorrect, because there has been no major curb on plying of diesel vehicles so far.